Extensive alfalfa winter injury can upset forage inventories, make dairy ration formulation difficult and result in the need to purchase hay, which can be expensive. Crop rotations also suffer when farmers switch to other crops to replace damaged alfalfa stands. In erosion-prone areas, conservation plans may restrict farmers from converting winterkilled alfalfa to corn or other row crops. Overseeding is a method by which other forage species are introduced into an established alfalfa stand. This Focus on Forage factsheet will discuss the options for overseeding other forage species into a thin alfalfa stand to extend the life of the crop and provide additional forage. Yield, forage quality, establishment, and management issues will also be addressed. What forage species can be used to thicken a thin alfalfa stand? Most producers would probably prefer to overseed additional alfalfa into a thin stand. However, overseeding alfalfa stands over one year old with additional alfalfa seed is not recommended due to the likelihood of autotoxicity issues. For additional information on auto-toxicity, please see the Focus on Forage factsheet, Seeding Alfalfa Fields Back into Alfalfa by Cosgrove and Undersander. Several other forage species have been utilized for thickening existing alfalfa stands, including cereal grains (oats, beardless barley, wheat, triticale); annual and perennial ryegrasses; sorghum-sudangrass; orchardgrass; and red, berseem and ladino clovers (1). Choice of species to overseed into alfalfa depends on the desired forage quality, yield, and length of stand extension needed. Overseeding with legumes such as red clover will result in a high quality product suitable for lactating dairy cattle when harvested at the appropriate stage (bud – <20% bloom). Unless harvested early (boot stage), overseeded cereals and grasses may result in a slightly lower quality forage, but will provide adequate tonnage and nutrients for dry cows, bred heifers and other livestock. Grasses overseeded into alfalfa stands generally produce higher yields of forage than overseeded legumes, so should be considered if higher yields are important. Adding a perennial species such as orchardgrass is useful if extending the stand life beyond the current growing season is desired. Annual grasses and cereal grains provide tonnage early in the growing season, but decline by mid-summer. They would be an appropriate choice for a stand that will be taken out for a late summer seeding after one or two cuttings (1). What can I expect for forage quality and yields? According to WI research conducted at the UW Lancaster Agriculture Research Station (Tables 1 & 2), orchardgrass, diploid/tetraploid Italian ryegrasses, or oats followed by sorghum-sudangrass all produce yields and forage quality comparable to that of a thinned alfalfa stand (less than 3 – 5 plants/ft2). Sudangrass alone produces somewhat lower yields and quality, but can be an emergency choice for land that could not be planted to corn silage soon enough after alfalfa winterkill was observed or after removal of an early first crop (2). I n this study, all forages were cut 3 times by Sept 1st in each year, except sorghum-sudangrass, which was cut twice in 1997 and 3 times in 1998/1999. Cuttings were timed to optimize forage quality and quantity (2). As shown in Table 2, there were significant differences only between yields for orchardgrass and sorghum alone, but no differences among forages for crude protein or relative feed value when compared to alfalfa. 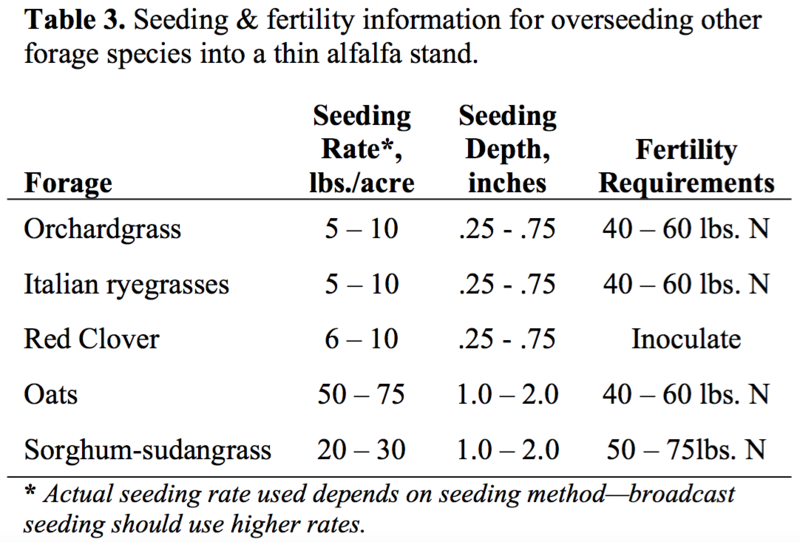 Research from other states also suggests that overseeding other forages into alfalfa has potential to extend stand life one or more growing seasons, and can be considered as an alternative when economics or conservation planning require maintenance of the current thin alfalfa stand (1). What establishment practices are recommended for overseeding alfalfa? 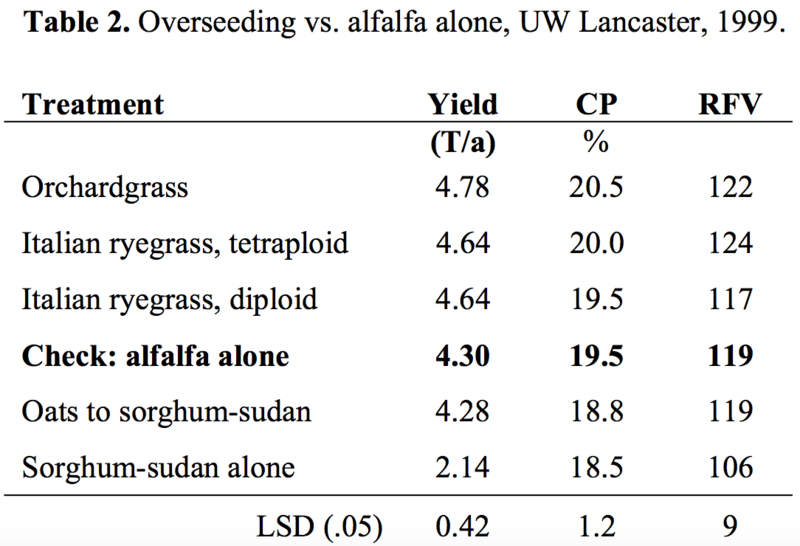 Research suggests that the benefits of overseeding on yield are not seen unless the alfalfa stand is less than 5 plants/ft2 or 40 stems/ft2 (1). Older alfalfa stands that carry a heavy weed load of species such as dandelion or quackgrass may be better candidates for rotation to another crop rather than for overseeding to extend the stand life. Ideally, cool season grasses, legumes, and cereals should be overseeded in April as soon as the soil is dry enough to plant into and the extent of winter injury damage is evident. Warm season annuals such as sudangrass should be planted later, when the soil has warmed to approximately 60°F. While a no-till drill is desirable, seeding with a conventional drill or broadcasting seed will also work. Tillage is usually unnecessary if seeding is done early enough and the soil is moist. Farmers who plan to extend the life of a thinned older alfalfa stand regardless of winter injury can also use frost seeding to add red clover, orchardgrass, or Italian ryegrasses. Frost seeding should be done in late February/mid-March, whenever frost seeding conditions are ideal. Since frost seeding results are sometimes inconsistent, other seeding methods may be more desirable for extension of stand life beyond the current season. Suggested seeding rates and seed depth are provided in Table 3. When using broadcast seeding methods, use the higher seeding rate to ensure adequate seed. Legumes added to a thin alfalfa stand should be inoculated prior to seeding to ensure adequate nodulation and nitrogen fixation. Cereals and grasses may need additional nitrogen at rates suggested in Table 3 to support yield and forage quality. If manure has been applied to the alfalfa stand during the previous fall or winter, additional nitrogen may not be necessary. What harvest practices are recommended? Forage from overseeded fields should be harvested at the appropriate stage for desired tonnage and quality and may be put up as greenchop, haylage, baleage or dry hay, depending on harvest conditions. Early harvest of cereals and annual grasses (prior to boot stage) will maximize quality and encourage a second cutting. Perennial grasses are usually harvested slightly later as they will need a longer initial establishment period. Red clover can be harvested at the same times that one would harvest alfalfa to obtain highest quality. One disadvantage of red clover is that it cures to a dark brown/black color, which some producers find visually undesirable. However, if harvested and stored properly, red clover’s quality is very comparable to that of alfalfa despite the darker color. Warm season annual grasses such as sudangrass should be cut at 24 – 30 inches tall and harvested on a 30 – 40 day schedule for dairy quality forage to be fed to lactating animals. For higher tonnage or silage, harvest at a later maturity (36 inches tall for heifers or 48 inches tall for dry cows or beef cattle). Leave at least 6 – 8 inches of stubble for regrowth. Overseeding other forages into a winterkilled or depleted alfalfa stand can be a fairly economical practice in comparison to re-establishment of alfalfa or rotation to a field crop. As shown in Table 4, seed costs may be only $5.00 – 16.00 per acre. Planting costs may be an additional $5.00 – $20.00 per acre, depending on the methods used, based on 2001 Wisconsin Custom Rate guidelines (3). Other costs that may be incurred would include additional fertilizer inputs that may be needed. Canevari, W.M., D.H. Putnam, W.T. Lanini, R.F. Long, S.B. Orloff, B.A. Reed and R.V. Vargas. 2000. Overseeding and Companion Cropping in Alfalfa. Univ. of CA Agric. & Natural Resources Publication 21594. 31 pp. Dan Undersander & Tim Wood. 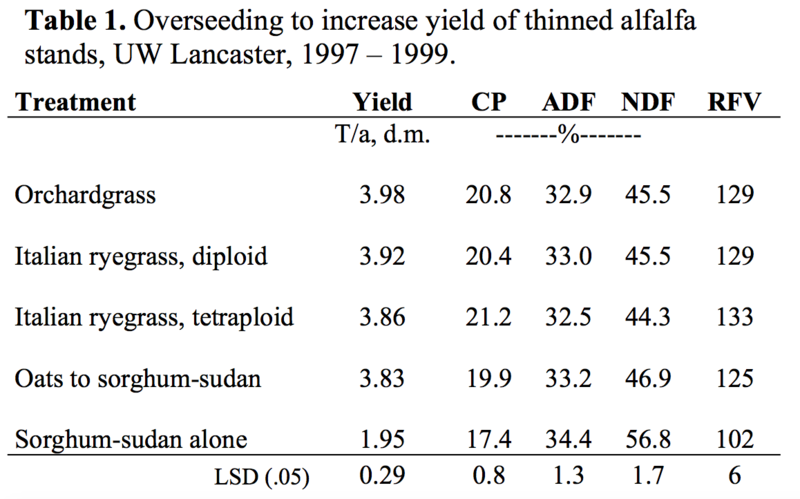 Personal communication on unpublished data: Interseeding into Thin Alfalfa Stands, Three Year Summary, 1997-1999, UW Lancaster Ag Research Station.